The Starwood Preferred Guest program is continuing its expansion — this time, by adding a new transfer partner in Virgin America. This is an interesting addition, as both companies are in the midst of acquisitions — SPG with Marriott and Virgin America with Alaska Airlines. While the future of the loyalty program associated with both programs is unknown at this point, there is one certain in that you can now transfer SPG Starpoints to Virgin America at a 1:1 ratio. Effective immediately, SPG members will be able to convert their ever-valuable Starpoints into Elevate points at a 1:1 ratio, and Elevate members will earn two points for every dollar spent on Starwood Hotel stays. With the latest addition of Virgin as one of SPG’s transfer partners, there are now 35 airline transfer partners — far more than the other transferable points options, which is one of the reasons TPG considers SPG Starpoints to be so valuable. Note that TPG values Virgin America points at between 1.5 and 2.3 cents each, so you should be able to retain most of the value of your Starpoints (valued at 2.5 cents each) with this new transfer option. As always, SPG will give you a bonus of 5,000 points or miles for every 20,000 transferred in a single transaction. Virgin America is widely considered one of the premium low-fare carriers, with service to more than 20 destination. The carrier is perhaps best known for its mood lighting, in-flight product and service, as well as fast super fast ViaSat satellite Wi-Fi. 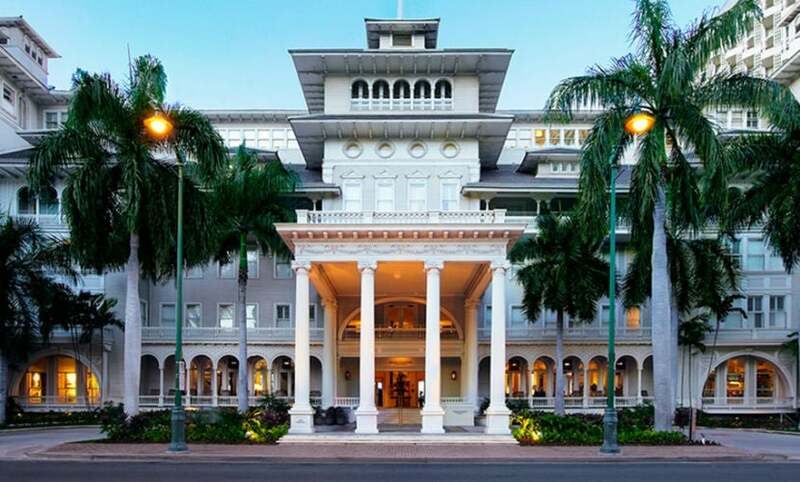 Winners of the promotion will receive airfare and a stay at one of two Starwood properties, like the Westin Moana Surfrider in Waikiki Beach. In addition, Virgin America is announcing a new promotion, “Work Hard, Hawai’i Hard,” which is aimed at incentivizing Los Angeles-based travelers to take advantage of Virgin’s new seasonal daily nonstop flights from LAX to Honolulu, Oahu and Kahului, Maui. Travelers can enter the promotion by submitting their Elevate number and why they need a vacation at MakeYourHawaiiscape.com by May 27. Everyone who enters the promotion will automatically receive 250 Elevate points. Winners will win a package, including tickets to the island state, as well as accommodations at either the Westin Moana Surfrider Hotel or the Sheraton Maui, plus 50,000 Elevate points. The two companies have also partnered to offer SPG members a chance to bid on an SPG Moments package for two. As of today, members can start bidding on the package, which will include tickets on both of Virgin America’s inaugural flights to Hawaii and a four-night stay at either the Westin Maui or the Sheraton Waikiki. Both packages offer extras, such as a tour of Maui farms and a private lunch, or a one-hour chartered Mai Tai Catamaran ride around the coastline of Oahu and a five-course wine pairing dinner on the pool lawn at the Sheraton Wikiki. The Moments also include Gold status with Virgin America for one year. If you were able to take advantage of the record-high welcome bonus on the Starwood Preferred Guest Credit Card from American Express and its business version, Starwood Preferred Guest Business Credit Card from American Express this could be a great opportunity to use those 35,000 Starpoints in transferring them to Virgin America. If you didn’t take advantage, both cards are currently offering a welcome bonus of 25,000 Starpoints after you spend $3,000 in the first three months on the personal card and $5,000 in the first three months on the business version.